As several Hall of Fame quarterbacks approach the end of their illustrious careers, it begs the question: Who will fill the void left by some of the game’s best signal-callers? It is one we have tried to answer by identifying which age-25-or-under QB will enjoy similar success to each of these quarterbacks — Drew Brees, Tom Brady, Ben Roethlisberger , Philip Rivers and Eli Manning. Roethlisberger’s quick rise through the ranks as the youngest Super Bowl-winning quarterback in NFL history at age 23, can be credited to his ability to play outside the pocket, efficient passing game and size. Despite yearly chatter about retirement, the 36-year-old hasn’t shown signs of slowing down, but his veteran status lends the question: Who will be the next Big Ben? Few compare to Roethlisberger other than Eagles quarterback Carson Wentz. The 2016 No. 2 overall pick is coming off a season in which he put the Eagles in position to win the franchise’s first Super Bowl, despite an injury that cut his 2017 campaign short. With Wentz’s stature, passing efficiency, ability to keep plays going with his feet and knack for winning, the Eagles quarterback yields a playing style similar to Roethlisberger and is capable, if he can remain healthy, to follow in the footsteps of Big Ben and become a Hall of Fame quarterback who spent his entire career in Pennsylvania. While Roethlisberger looks much thicker on the field, Wentz is listed only three pounds lighter at 6-5, 237 pounds. Their physicality and athleticism is undeniable. They’re both big, strong and physical in the pocket and notoriously difficult for defenders to take down. Another benefit to their build is hand size. Big Ben’s measures at 9 7/8 inches while Wentz comes in at 10, helping both quarterbacks hold onto the ball and ultimately leading to less fumbles. Of the three top quarterbacks taken out of the 2004 draft, Roethlisberger has fumbled the least amount with 91 throughout his career, while Eli Manning has 115 and Philip Rivers has 99. Roethlisberger has strong vision down the field, and Wentz has a similar strength in being able to make big plays outside of the pocket. They both have a strong arm and can launch the ball way down the field and over the top of the defense. With that comes a sense of chemistry and trust they both have built with pass catchers. It doesn’t really matter who the man is, Roethlisberger and Wentz make teammates look good by making plays average quarterbacks simply can’t. Both programs hired first-time head coaches early in each QB’s tenure as Mike Tomlin took over for the Steelers in 2007 and the Eagles hired Doug Pederson in 2016. With a strong leader at the helm of a steady program continuing to improve, Wentz naturally is in a situation that lends itself to a successful career. Roethlisberger and Wentz share the undeniable gift we call “arm talent.” They simply deliver big plays that shouldn’t be possible. One example of this is from 2016 when Roethlisberger made a huge 72-yard touchdown pass to Sammie Coates against the Jets. Regardless of the situation, Roethlisberger’s arm allows him to make just about any throw. A similar play Wentz made was in 2016 when he threw a 64-yard touchdown pass to Mack Hollins, which traveled 62.8 yards in the air — the farthest pass by any quarterback at that point in the season. How did @cj_wentz escape that? ? On paper, Roethlisberger’s and Wentz’s first two years in the NFL are strikingly similar. 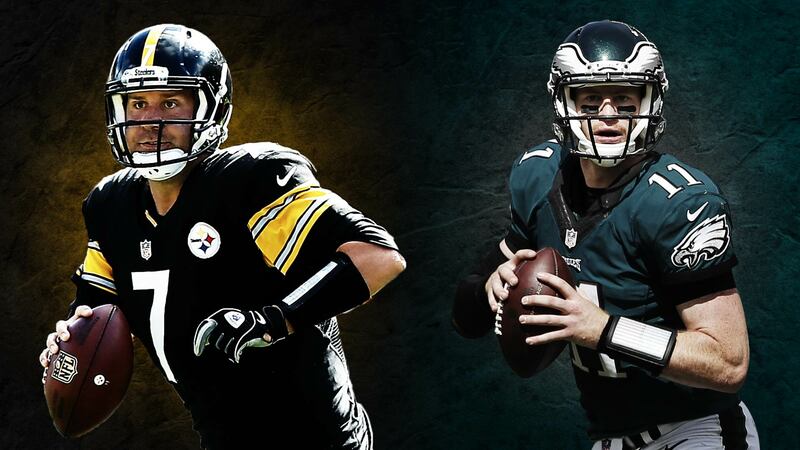 Young Roethlisberger completed 64.7 percent of his passes for 5,006 yards with 34 touchdowns, compared to Wentz’s 61.5 completion rate for 7,078 yards and 49 touchdowns. They both had a relatively low amount of interceptions, and as proof of the benefits of their size: Roethlisberger was sacked only 53 times, while Wentz had 61 sacks. To put that in perspective, Indianapolis’ Jacoby Brissett was sacked 52 times in 2017 alone. Another quarterback on the rise who drew comparisons to Big Ben during the 2018 draft Is Bills rookie Josh Allen. Allen doesn’t have playing time in the NFL to compare just yet and still has a long way to go, but based on what he did under center at Wyoming, he could create a resume similar to Roethlisberger.